I absolutely love Bulgari. And while I can't necessarily treat myself to the gorgeous jewels the house has to offer, I certainly can splurge on their beauty products from time to time. So it's no wonder that the second I picked up Bulgari Eau Parfumée Au Thé Vert Bath and Shower Gel, I was hooked. The bottle itself is one of absolute luxury. The green silhouette swoops and curves into a softly shaped rectangle, resulting in a white-speckled top that snaps open ever so discreetly. But the fragrance within is anything but discreet -- out wafts a refreshingly zingy scent that makes me feel alive, radiant and ready to take on whatever the day brings. Many interesting notes make up this finely fragranced shower gel. Italian bergamot, Tunisian bitter orange, Spanish orange blossom, Jamaican pepper, Russian coriander, Egyptian jasmine ... all of these exotic notes mix with ceylon cardamom, Bulgarian rose, smoked wood and, of course, green tea. As green tea leaves are known for their healing and relaxing effects, why not make them the base note in this delightful fragrance? If there's any way to feel more like a queen during your morning shower, I haven't found it yet. 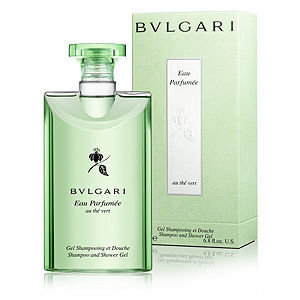 Bulgari Eau Parfumee Au The Vert Bath and Shower Gel retails for $42 at beauty.com.